Wherever Paradis is slotted, it's a lot of money for a guy who started working on his dad's farm as a 5-year-old kindergartner. ENGLEWOOD – The Broncos have been talking with center Matt Paradis’ representatives about a possible contract extension, although a deal does not appear imminent. “We’ve had conversations,’’ agent Brian McLaughlin said while offering no details. It’s not a surprise. Recent history is on Paradis’ side. He was a restricted free agent this offseason, leading to a $2.914 million salary off a second-round tender. The Broncos reached contract extensions with two previous restricted free agents – linebacker Brandon Marshall in 2016 and kicker Brandon McManus in 2017 – before the start of their respective RFA seasons. 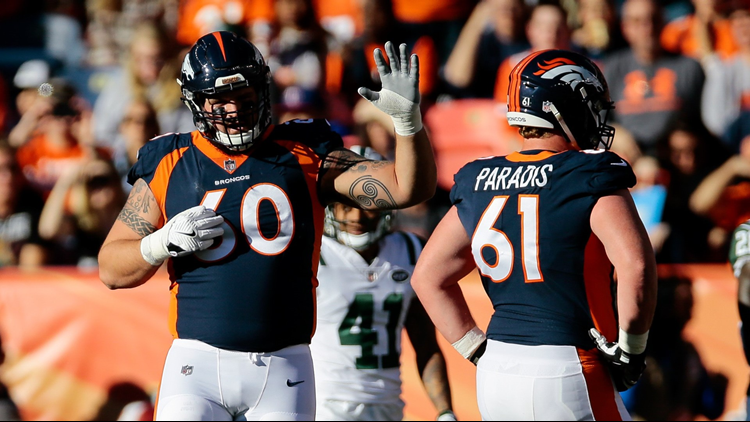 Paradis has earned the right after he has made every offensive snap starting with the Broncos’ Super Bowl 50 season of 2015. He never missed a snap in 2016 even though he couldn’t practice because of bum hips. He never missed a snap in 2017 even though he had each hip surgically repaired. Paradis appears bigger and stronger this season as he’s been able to strength train his lower body for the first time in two years. So what kind of contract can Paradis expect? The NFL’s highest-paid center is Tampa Bay’s Ryan Jenson, the former Fort Morgan High School and CSU-Pueblo star who through free agency signed a multiyear deal worth $10.5 million a year in March. The fifth-highest paid center is Atlanta’s Alex Mack and Seattle’s Justin Britt at $9 million a year. The 10th-highest-paid center is Carolina’s Ryan Kalil at $8.375 million. Wherever Paradis is slotted, it’s a lot of money for a guy who started working on his dad’s farm as a 5-year-old kindergartner. Devontae Booker took the first rep lined up behind Case Keenum in the Broncos’ scrimmage Sunday. On the next play, De’Angelo Henderson got the first carry. Rookie Royce Freeman went third, Phillip Lindsay got a carry as the fourth running back in and before Keenum was through with his first-team set, the fifth and final tailback, rookie David Williams, got a rep.
That will probably be the running back order when the Broncos release their first depth chart on Tuesday. But the fact every running back is still getting first-team reps as training camp moves into its second week suggests there hasn’t been much separation. Third-round rookie cornerback Isaac Yiadom was the Broncos’ No. 3 corner in place of the injured Tramaine Brock for the scrimmage Sunday. That means Yiadom is ahead of second-year, third-round corner Brendan Langley. Surprised? “I’m not surprised,’’ said No. 1 corner Chris Harris Jr. “Isaac, he’s been able to make plays. He’s working his tail off every day. Listens. He’s a smart player, so I’m not surprised at all. Joseph said left guard Ron Leary was held out of the scrimmage as a precaution. Leary had arthroscopic knee surgery in late-May and had participated in each of the first seven camp practices. Brock (knee), cornerback Marcus Rios (hip), tight end Jeff Heuerman (knee), defensive end Adam Gotsis (ankle) and receiver Corey Brown (concussion) also missed the scrimmage. The Broncos have Monday off. They will resume camp on Tuesday when they will begin preparing for their first preseason game Saturday night against the Minnesota Vikings. How about this for Game 1 quarterback storylines: Keenum vs. Kirk Cousins for the first quarter; Paxton Lynch and Trevor Siemian renewing their quarterback competition in the second quarter; and Chad Kelly meeting last year’s preseason No. 3 quarterback darling, Kyle Sloter.